On June, my 56-year-old husband received the shocking news that he has multiple brain tumors. My children and I listened in shock as the doctor told Louis he had just a few weeks to live with out radiation and possibly to the end of the year with radiation. He chose not to have the radiation but to seek alternative methods and came home the next day. That night we had our first visit from Master Tam Trong Huynh of Vovinam Green Bamboo. He is a small man full of energy with a big warm smile, quick movements, and brain filled with knowledge and experience, and a huge heart overflowing with love. 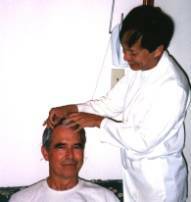 As we watched Master Tam lovingly work on Louis a new feeling of hope filled our home. Master Tam’s big smile and laughing voice had everyone feeling better. Smiling Louis asked him when he was coming back. Master Tam is a busy man, he can not return to our house; instead we started our many trips to Master Tam’s home. You can not feel bad at Tam’s house because it is filled with happiness, love and activity. Tam has not only helped us emotionally but he has also helped Louis’ pain and the swelling around his tumors. After talking to his Master, he told us with tears in his eyes and a big smile, that he could make the tumors disappear by cutting off their blood supply. A MRI revealed 12% decrease in the size of the tumors! CATSCAN’ s are showing a reduction of swelling around the tumors. Tam is now, after a lot of studying, treating him for an inflamed gall bladder. Tam was also able to reduce my dangerously high blood pressure with acupuncture. My family, Louis, and I send a very special thanks to Tam and his lovely wife, Ha, for all of their help and love they are giving during this time of Louis’ illness.